Israel Terrorizes Hebron Residents. Settlers urge Soldiers to Kill the Palestinians. Hebron is a microcosm of Israel’s war on Palestine, unrestrained state terror, at least 22 of its residents murdered by security forces since October 1 alone. “There has been no ‘normal fabric of life’ in Hebron for many days, and the measures taken in the name of security are draconian and not dictated by reality,” it stressed. Tel Rumeidah neighborhood near Hebron’s Old City is besieged, completely closed off and isolated – access granted only to so-called “registered residents,” forced to endure intrusive security checks on entering or leaving, discouraging free movement altogether. Some residents refused to submit their names to a security list required for them to enter their own homes freely. Others are denied entry for various intolerable reasons. Tel Rumeida resembles a ghost town. Visible residents are settlers, many openly displaying guns, protected by heavily armed soldiers in combat gear. Palestinian shops and other businesses were closed, their owners denied access. 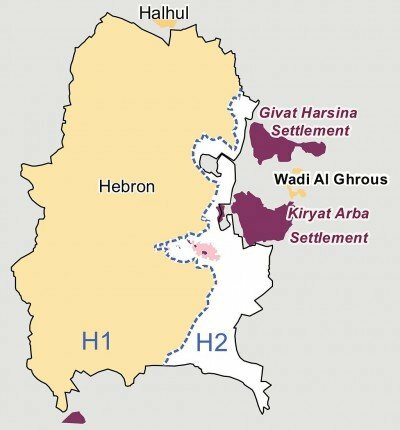 Draconian measures were imposed on area villages and towns, sealed off like Hebron. Thousands of Palestinians endure severe disruptions to their daily lives, collectively punished, commonplace Israeli policy – US major media ignoring what’s ongoing entirely, reporting nothing, horrific human rights abuses unnoticed. Ostensibly to protect approximately 600 fundamentalist Israelis that have forcibly established a settlement right in the heart of Hebron, the Israeli state has imposed on the Palestinian residents of the city a regime of forced evictions, curfews, market closures, street closures, military checkpoints, subjection to military law including frequent random searches and detention without charge, and lack of protection from rampant settler violence, which has pressured approximately 13,000 Palestinian civilians to flee their homes in the Hebron city center, turning it into a virtual ghost town. The area is surrounded by hostile settlements, Palestinian residents terrorized by harassment, violence, and vandalism, Israeli closed military zones imposed to displace them from their own land – forcing them to leave, preventing their return, confiscating their property and possessions, whatever they can’t take with them. YAS coordinator Issa Amro said Hebron “is besieged. Soldiers storm Palestinian homes pre-dawn, evicting their residents, taking them over. The raid happened hours after heavily protected settlers attacked Hebron area Palestinian homes. Besieged residents call draconian conditions intolerable. Overnight Saturday into early Sunday morning, soldiers kidnapped 18 Hebron area Palestinians, at the same time storming and ransacking homes. On Sunday, Israeli media said Netanyahu will offer Palestinians supposed goodwill gestures when he meets with Obama on Monday, aimed at easing tensions, a shameless ploy to try ending justifiable resistance, another unconditional surrender scheme likely to be denounced and rejected by long-suffering people demanding freedom.